On Wednesday, the Associated Press reported that authorities foiled a plot by two Florida middle-school girls who planned to kill their classmates, drink their blood and eat their flesh. 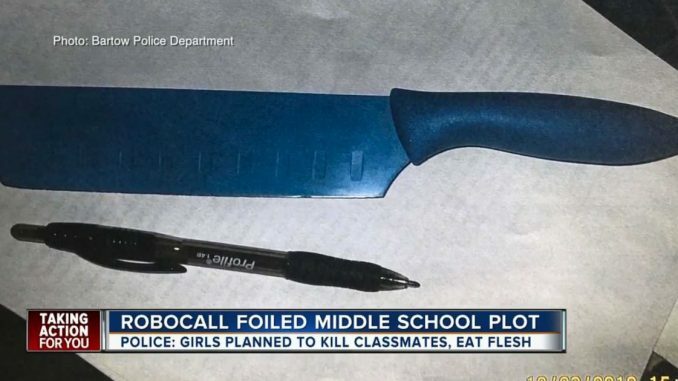 The two knife-wielding girls, aged 11 and 12, were arrested by the Bartow, Florida, Police Department and now face charges of conspiracy to commit first-degree murder and possession of a weapon at school. According to reports, the plot was foiled after one student warned a teacher on Monday that the girls were overheard discussing the planned attack. One of the girl’s mothers apparently received an automated call telling her that her daughter was not at school. She called the school, prompting a campus-wide search for her. Fortunately, no one was harmed.